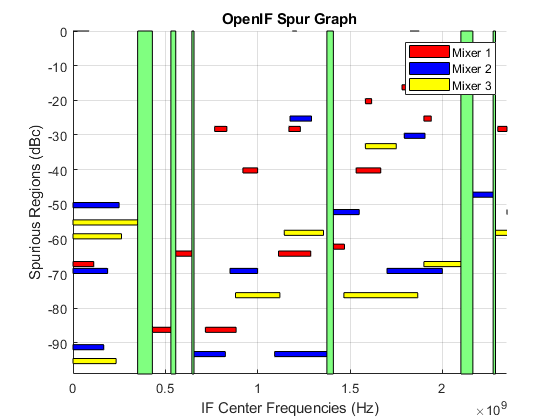 Use the OpenIF class to analyze the spurs and spur-free zones in a multiband transmitter or receiver. This information helps you determine intermediate frequencies (IFs) that do not produce interference in operating bands. hif = OpenIF creates an intermediate-frequency (IF) planning object with properties set to their default values. hif = OpenIF(Name,Value) creates an intermediate-frequency (IF) planning object with properties with additional options specified by one or more Name,Value pair arguments. hif = OpenIF(bandwidth) creates an intermediate-frequency (IF) planning object with a specified IF bandwidth. hif = OpenIF(bandwidth,Name,Value) creates an IF-planning object with a specified IF bandwidth and additional options specified by one or more Name,Value pair arguments. Bandwidth of IF signal, specified as a real positive scalar. The value you provide sets the IFBW property of your object. Location of IF, specified as a 'MixerOutput' or 'MixerInput'. Setting IFLocation to 'MixerInput' specifies an up-converting (transmitting) configuration, where one IF is mixed up to multiple RFs. The following figure shows this convention. Setting IFLocation to 'MixerOutput' specifies a down-converting (receiving) configuration, where multiple RFs are mixed down to one IF. The following figure shows this convention. The setting of IFLocation determines the available values for the injection argument of the addMixer function. Maximum difference in magnitude between a signal at 0 dBc and an intermodulation product that the OpenIF object considers a spur, specified as a scalar in dBc. System wide IF bandwidth, specified as a scalar in hertz. You can also set this property using the optional bandwidth input argument. Set up an OpenIF object as a multiband receiver, add three mixers to it, and obtain information about its spur-free zones. Define an OpenIF object. The first input is the bandwidth of the IF signal (50 MHz). The 'IFLocation','MixerOutput' name-value pair specifies a downconverting configuration. Define the first mixer with an intermodulation table and add it to the OpenIF object. Mixer 1 has an LO at 2.4 GHz, has a bandwidth of 100 MHz, and uses low-side injection. Mixer 2 has an LO at 3.7 GHz, has a bandwidth of 150 MHz, and uses low-side injection. Mixer 3 has an LO at 5 GHz, has a bandwidth of 200 MHz, and uses low-side injection. The multiband receiver is fully defined and ready for spur-free-zone analysis. Use the report method to analyze and display spur and spur-free zone information at the command line. The method also returns information about the mixers in the receiver. 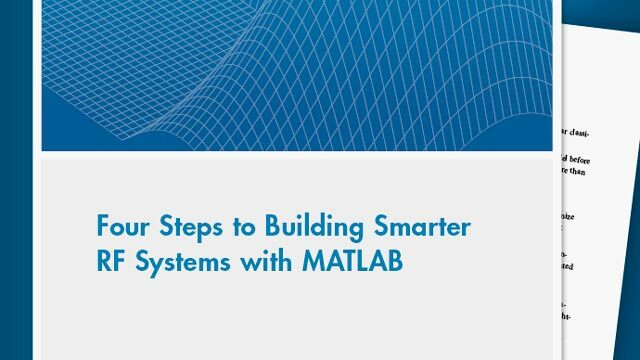 Use the show method to analyze the receiver and produce an interactive spur graph. Generating a spur graph is a convenient way to summarize the results of the analysis graphically.